To all my faithful readers (and even to the regular lurkers) here at Nate's Nonsense, I want to wish you all the happiest of Thanksgivings. I hope your day is filled with good cheer and appreciation for life and its blessings. Among the many things I am grateful for is you. Thanks for the wonderful posts and encouragement! Who could they be? That's the mystery! Yet I ask not their identity. Instead, explain their activity! Go ahead take a guess and then go enjoy some turkey. Check back tomorrow and I'll reveal the answer. The first correct post will be declared the winner. Happy Thanksgiving to you and your family Nate! I enjoy your blog! Thank you Nate for your Thanksgiving wishes. My family is happy to offer you and yours the same. I offer two links in the Thanksgiving spirit. oops.. forgot to make a wild guess. I remember long, long ago. 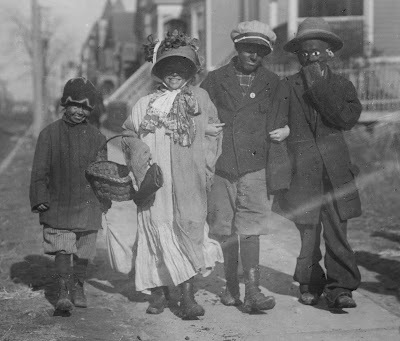 A teacher told us youngsters that she and her friends used to dress in black face for May Day. I have tried but can not recall her reasoning. This was in the 1950's so the memory is foggy at best. A wonderfull Thanksgiving to you, your family and everyone else you love. Thanksgiving Maskers; in the early 1900's, before Halloween became a national holiday, children dressed up as hobos on Thanksgiving and went out to beg for food and coins. In Holland, on the evening of November 11 (St. Martin's Day), children go in small groups through the streets with paper lanterns and candles. In some parts of the country they also ring doorbells and sing songs in return for candy.